Microsoft isn’t all that shy when it comes to integrating its desktop OS, Windows 10, with Google’s Android. 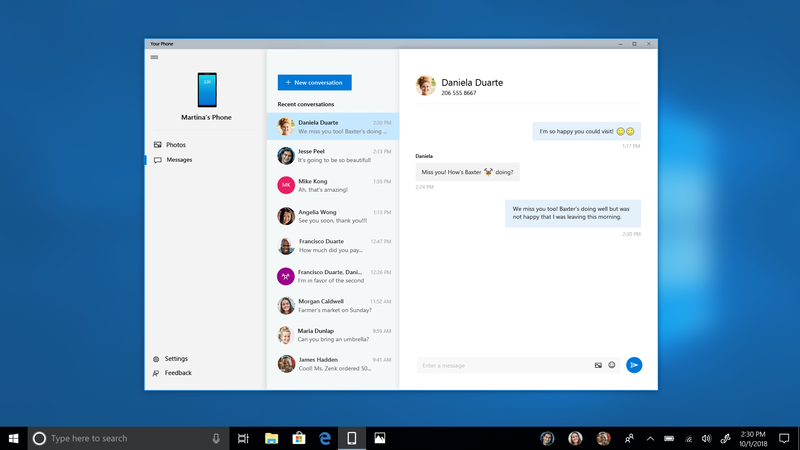 Now, with the debut of a new Insider build of Windows 10, Microsoft is introducing a new app called ‘Your Phone’ that lets your devices talk to each other natively. Windows 10 Insider Preview Build 17755 debuted late last week and as Microsoft details in a blog post, it’s highlight feature is a new app simply entitled “Your Phone.” This app connects to your Android device and allows users to access their text messages and even photos while using a Windows 10 PC. Users will need to install “Microsoft Apps” from the Google Play Store to get this working. Once both your PC and that app are signed into the same Microsoft account, the app will require a few permissions from your Android device, and then everything should start working. This app is still being “finetuned” by Microsoft’s developers, but it looks like an excellent addition to Windows 10 as a very handy tool. Hopefully, it’s something that will go out to all users in the coming weeks. No need to dig for your phone to text. Leave it in your pocket, bag, or purse. Your Phone app now gives you instant access to your most recent photos and texts from your Android phone. Snap a pic on your Android, see it on your PC. It’s just easier. Text your friends, group message, and type with a keyboard—Your Phone app allows you to view, send, and receive the SMS from your Android, on your computer.